The sort tab is used to control the sorting of containers, adornments and agents. 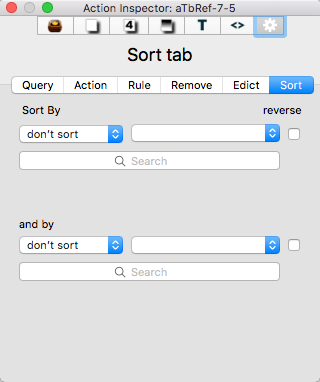 Sort by / (transform type) /reverse. Optionally, sets a sort order on any attribute value (pop-up menu), a transform on the order (pop-up menu), with the sub-option of reversing that order (tick-box). Values are persisted in the agent's $Sort, $SortTransform and $SortBackward attributes. This may be edited. and by/ (transform type) / reverse. Optionally, sets a sort order on any attribute value (pop-up menu), a transform on the order (pop-up menu), with the sub-option of reversing that order (tick-box). Values are persisted in the agent's $SortAlso, $SortAlsoTransform and $SortBackwardAlso attributes. This may be edited. From v7.5.0, both sets of selector offer a Search box to assist in quickly locating the desired attribute on which to sort. Sort order depends on the data type of the attribute being used for sort, e.g. lexical vs. numerical vs. date, etc. In languages using accented characters, relative lexical sort order of accented characters may vary by locale. Once set, Tinderbox continues to sort new items to reflect that setting. However, it is often the case that contents are not under constant change and all that is needed is a one-off sort. To do this, select the desired sort attribute, wait a few moment for the sort to occur and then return the setting to don't sort. Sorting agents to reflect the relative outline location of original notes: to do this set the agent's transform type to 'original note' and leave sort as 'don't sort'.